I wanted to share with you the lovely teether Grace got brought by Santa 😉 for Christmas. I’m not sure how I first found Hopes, Dreams and Jellybeans on Instagram but I soon became a little bit obsessed with the products on there, so when I saw personalised, limited edition, star teethers on there I knew I had to buy one. I had always been a bit hesitant about getting Grace any teething toys as I kind of wasted money with that kind of thing when Oliver was a baby. I remember he had the Nüby keys and they got more use as actual keys once he was a bit older than as teething toys. 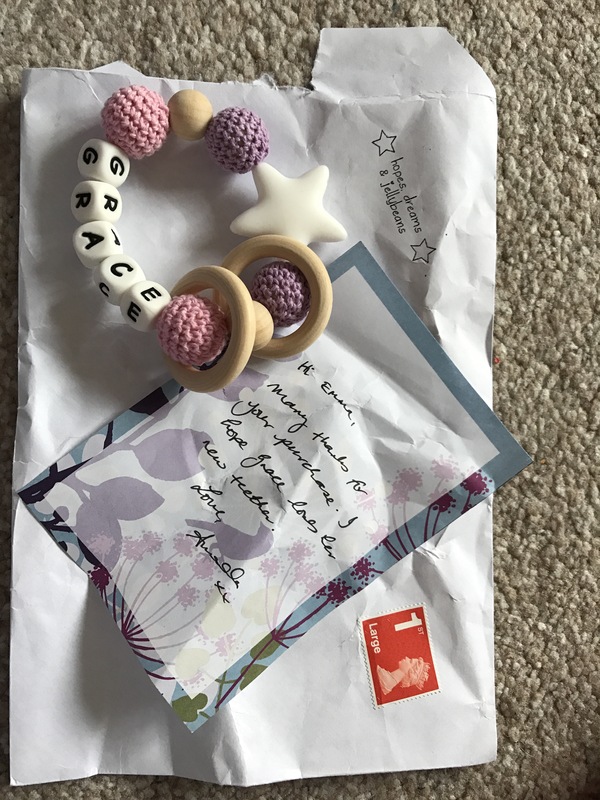 I really liked the fact the Hopes, Dreams and Jellybeans teethers were personal though and I thought, if nothing else, it could become a keepsake for Grace’s first Christmas. 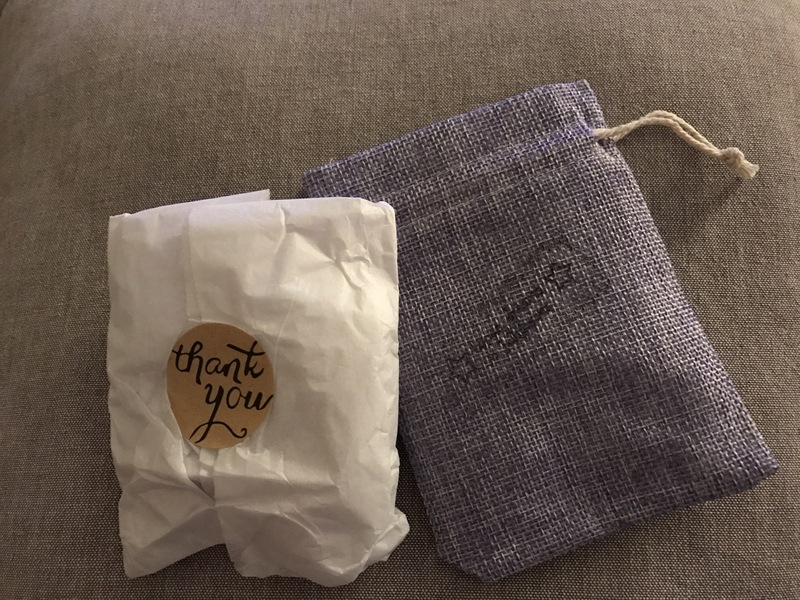 There is an etsy shop where Amanda, who makes all the items, lists them for sale as well as being able to order via direct message on Instagram (which I did). I asked a couple of questions about the materials and chose colours then sent payment and that was that! No hassle at all and Angela was really lovely. I can’t remember exactly how long it took, but I received my order in less than 14 days. It was probably a lot sooner to be honest, but I think two weeks, in November, for a personalised product is pretty good and I was in no rush with it being for Christmas. Now I wanted to give Grace a good chance to have a play with it, Oliver named it her Gracelet haha, and see how she felt about it. It’s nice and small, easy to stuff into a pocket in the changing bag, and the right size for Grace’s little hands to hold. As you can see it’s got the star and letters which are made of silicone, crochet covered wooden balls then the wooden pieces. I was a bit wary of the crochet and I could have had silicone beads, but they are actually Grace is favourite bit! It’s always those or the star that she chews on! The teether is BPA free, food grade silicone and the cord is nice and strong so I have no worries about it all falling apart as Grace is playing with it. I couldn’t be happier with it. Amanda also makes teething necklaces and dummy/toy clips which you can either buy as the listed item on etsy, or by making a custom order with her so you get something totally unique for you or your little one. I would definitely recommend Hopes, Dreams and Jellybeans, I’m just trying to decide what to get next!